In order for residents to be notified of a Town Meeting or State or Local Election, Public Notices regarding the date, time and location are posted at least seven (7) days before each Town Meeting or Election. Residents may also view upcoming elections scheduled on the community Calendar of Events or Sign Up for E-Mail Updates to receive information regarding upcoming Elections. The annual election of Members of the Board of Selectmen, School Board Members, Road Commissioner and Planning Board Members is held on the last Thursday of March of each year at the Frankfort Congregational Church Vestry located at 42 Main Road South. The State typically holds Elections on the second Tuesday in June and first Tuesday in November of each year. The Primary Election is held on the second Tuesday of June of each even numbered year, while the General Election is held on the first Tuesday in November also in each even numbered year. Referendums may be held at either the June or November election. The polls are open from 8:00 AM to 8:00 PM at the Frankfort Congregational Church Vestry located at 42 Main Road South. View State of Maine Elections Division site. Registered voters of Frankfort may vote absentee in person at the Town Office during the hours of the Town Clerk: 8:00 AM to 12:00 PM and 6:00 PM to 9:00 PM on Monday; 8:00 AM to 5:00 PM on Tuesday, Wednesday and Thursday; and 9:00 AM to 3:00 PM on Friday. An application is not required if the voter votes in person at the Town Office. Residents who are not registered to vote may register to vote during these hours and request an absentee ballot at that time. For more information on how to register to vote, click here. 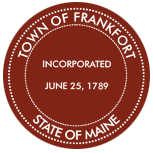 Registered voters of Frankfort may call the Town Clerk at (207) 223-5546 to request an absentee ballot for themselves only. The Town Clerk will complete the application and a ballot will be mailed directly to the voter at the mailing address provided. Requests for an absentee ballot for an immediate family member must be made at the Town Office, as these requests need to be made in writing on the application provided. Registered voters of Frankfort may request an absentee ballot by email through the Secretary of State’s website. Click here to request an absentee ballot by email. Once the State-approved form is filled out, the Secretary of State’s office will e-mail the request to the Frankfort Town Clerk’s Office for processing and the voter will receive the ballot in the mail by the United States Postal Service. Registered voters of Frankfort may fill out and sign an application to request a third party to deliver their ballot to them. The Clerk will give the ballot to the third person named on the application and that person will deliver the ballot to the voter. In this case, when the voter votes, the absentee ballot envelope must be signed by the voter and also signed by two witnesses, or one “special” witness (ie – a notary public, a municipal clerk, or clerk of courts). Unexpected absence from the municipality during the entire time the polls are open on Election Day. Unexpected physical disability or an incapacity or illness that has resulted in the voter’s being unable to leave home or a hospital or other treatment facility. Inability to travel to the polls if the voter is a resident of a coastal island ward or precinct. The Board of Selectmen appoint Election Clerks to assist the Town Clerk with voting activities on Election Day. Members of both major political parties are appointed to ensure there is balance within the process, and appointments last one full election cycle. Title 21-A Section 503 of the Maine Revised Statutes Annotated outlines the role and responsibilities of an Election Clerk. Registered voters of Frankfort who would like to run for the Board of Selectmen, School Board, Planning Board or Road Commissioner must stop by the Town Office during regular business hours after nomination papers have become available for the March Municipal Election. Typically, nomination papers are available by the beginning of January. Check the Public Notices section of this website during the month of December for an exact date. Candidates will have forty-five (45) days from the date the papers become available in the Town Clerk’s Office to circulate nomination papers for registered voters to sign, stating that they nominate the candidate for Board of Selectmen, School Board, Planning Board or Road Commissioner. The required number of signatures is no less than 25 or more than 75. Once the required number of signatures has been achieved, the candidate must return the nomination papers to the Town Clerk for certification. If the Town Clerk validates the required number of signatures, the candidate’s name will be printed on the Municipal Ballot for the March Election. Any questions regarding this process may be directed to the Town Clerk at (207) 223-5546. Candidates interested in running for a State Office should visit the State Website of the Secretary of State’s Bureau of Corporations, Elections, and Commissions, which includes a Candidate’s Guide, procedures, and forms.